JVOM – Just vomited, as in “He spent an hour recounting every mile of his triathlon. JVOM JFA.” (Double points for double usage). 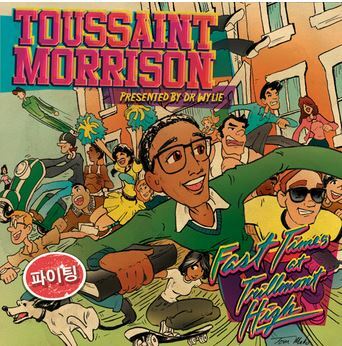 After over-indulging in the extreme dosage of “holy crap that’s adorable” of Toussaint Morrison’s “Can’t Relive the Party” I checked out his bandcamp and found that he’s more than just a pretty face and golden pipes – the man a) oozes creativity and b) has a story to tell. A winning combination for an artist. His most recent album, Fast Times at Trillmont High, tell the story of Juice, a tutor at a fictional high school in the midwest, giving a tour to Ms. Day, a visiting teacher from a school in South Korea. According to his Facebook, the album was inspired when Morrison was hired on to teach spoken word poetry at a high school in Minneapolis. To publicize, he went classroom to classroom performing rap and spoken word poetry about the class, racial disparity, drop-out rates, and stratification in Minneapolis, which led to huge student enrollment, and a dismissal the next day.